The earliest maturing and a great addition to the series, Sunlemon F1 is simply gorgeous. Lovely lemony yellow fruits averaging approx. 18-22g in weight. Nice subtle sweet flavour. Indeterminate. 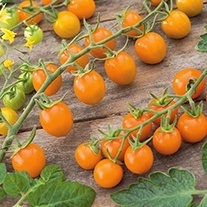 We all know and love Sungold F1 (one of our top sellers every year) but the other varieties listed below are totally new and, in fact, are sister varieties to Sungold - so they benefit from all its positive attributes. All have unique colours, from the bright red of Suncherry Smile F1 to the dramatic chocolate of Sunchocola F1 and they all have deliciously sweet flavour with thin skins - just perfect for eating fresh from the vine. Disease resistance is really good too, with plants remaining strong and sturdy throughout the summer. For greenhouse crops sow indoors, a warm kitchen windowsill is all you need for starting these seeds. Sow 0.5cm (¼in) deep, thinly in a pot of compost. Water well and place in a warm position. A temperature of 15-20°C (60-68°F) is ideal. Keep moist. Seedlings usually appear in 7-14 days. Transplant to individual pots when 10-15cm (4-6in) tall. Grow on in cooler, but not cold conditions. Plant out April to May, to large pots, growing bags or greenhouse border. Provide support, pinch out side shoots regularly and pinch out growing tip after 5-6 trusses have set. For outdoor crops delay indoor sowing until March or April. Gradually accustom plants to outside conditions (avoid frosts), before planting out 45cm (18in) apart, when frosts are over. Harvest outdoor crops from August onwards. 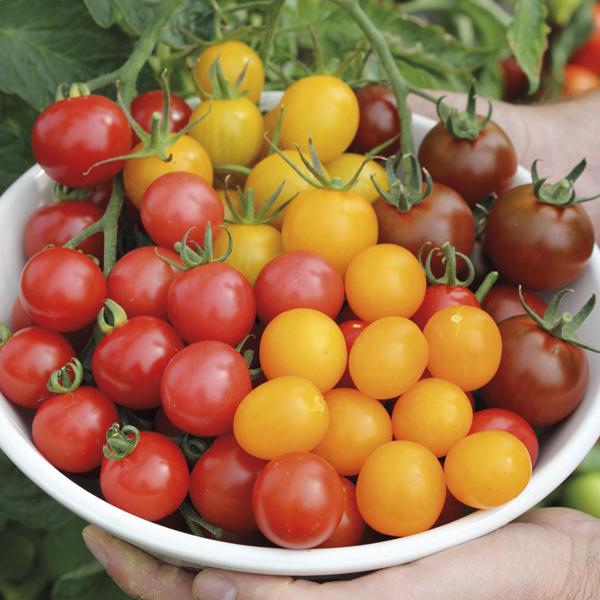 Tomatoes growing in a greenhouse require plenty of ventilation and water, feed regularly once trusses have set.